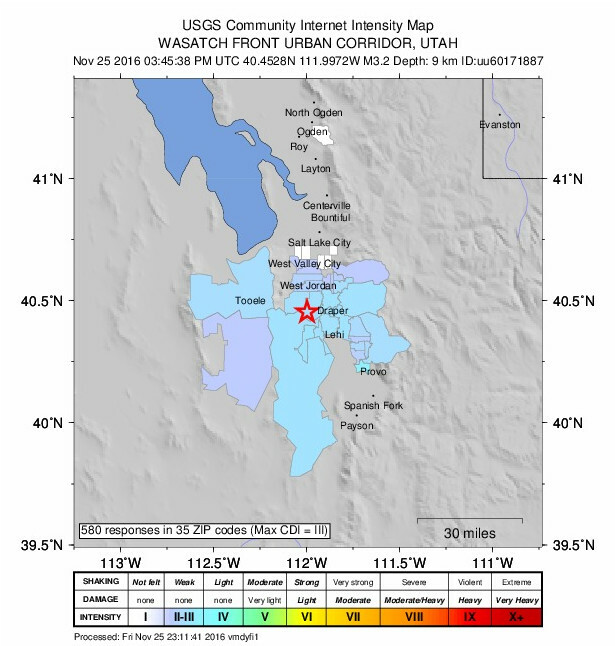 ST. GEORGE — Hundreds of residents in northern Utah – from West Valley City to the southern tip of Utah County – reported feeling the shakes of a Friday morning earthquake. Colored areas denote intensity of earthquake based on an internet survey of area residents by the United States Geological Survey, Map generated at 3:45 p.m. Nov. 25, 2016 | Image courtesy of United States Geological Survey, St. George News | Click on image to enlarge. The earthquake measured at magnitude 3.2 and was reported to have occurred at 8:45 a.m. about six kilometers south of Bluffdale, according to the United States Geological Survey. Nearly 600 people reported feeling the quake, according to a survey on the USGS website. Aftershocks are likely but will probably be too mild to notice. FOX13 in Salt Lake City reports many of the station’s viewers felt the morning rumble. The University of Utah Seismology Stations also received hundreds of reports from people who felt the earth move. Measurements of the quake show the shaking wasn’t strong enough to have caused damage, but was strong enough for someone to feel light movement. Seismic activity and earthquakes are not uncommon in Utah; the USGS reported 41 incidents of seismic activity in the region encompassing northern Utah within the last three weeks. If you are indoors, stay there. Get under a desk or table and hang on to it (drop, cover, and hold on) or move into a hallway or against an inside wall. Stay clear of windows, fireplaces and heavy furniture or appliances. Get out of the kitchen, which is a dangerous place (things can fall on you). Don’t run downstairs or rush outside while the building is shaking or while there is danger of falling and hurting yourself or being hit by falling glass or debris. 3.2 ? ..Okay calm down everybody a food blender creates a 3.2 all by itself ! LOL if you were living in California you wouldn’t see this article. be safe out there folks !